Ciara's baby is finally here. The singer and husband Russell Wilson welcomed their daughter which they have since named Sienna Princess Wilson on Friday at about 7:03pm. The beautiful mom shared the news with a lovely letter to her newborn on Instagram. "Dear Sienna Princess Wilson,No matter how big the wave, we will always be your calm in the storm. We Love You. Love, Mommy & Daddy.7:03 pm7 lbs 13 oz. 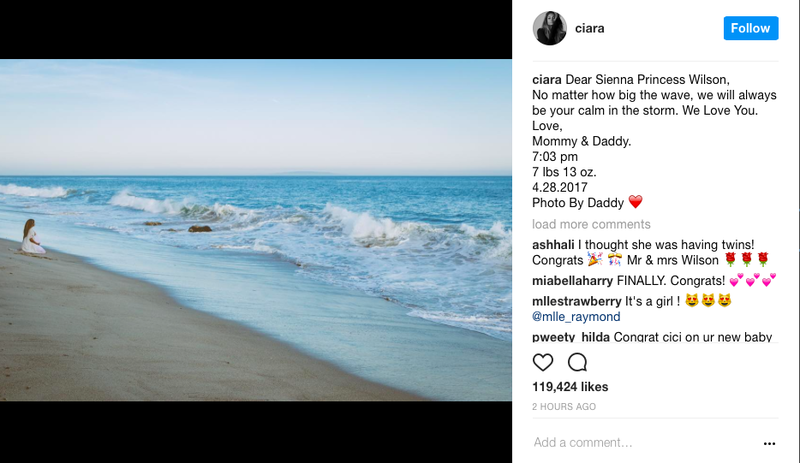 4.28.2017Photo By Daddy ❤️"
Ciara already has a son Future Zahir with her rapper ex Future.